I am very proud that this April first we will be celebrating the one squadrothionth Liar’s Ride. Very few rides make it to their dupliantharallellianth ride or their googledecahydrothianth ride, or even their lousy one billionth ride, but to reach one squadrothion is really something special. I think you all for the support throughout the years/galaxies/epochs/parallel universes. It is really all of you, those that survived AND their heirs that made this ride special. We would not be endorsed by every major chemical polluter in the Western hemisphere if it weren’t for the lunch-bucket, hard-working, a-list team of cracker jack participants that we get every year. The years add up, and sooner or later, your staring at your one squadrothionth ride. Give it up. To yourselves. This year we will be visiting the memorial for all those that we lost on Liar’s Rides over the years, located at the bottom of the Spire site, herein dubbed the Chicaghole. We’ll also rejoice in getting above the 50% mortality rate for ride participants for two years in a row! Way to go! But before we detail the presidential candidate ride-alongs, the in-ride filming of the next Spike Lee movie, or any of the celebrity guest corkers that will join us this year, I have to be serious for a bit. 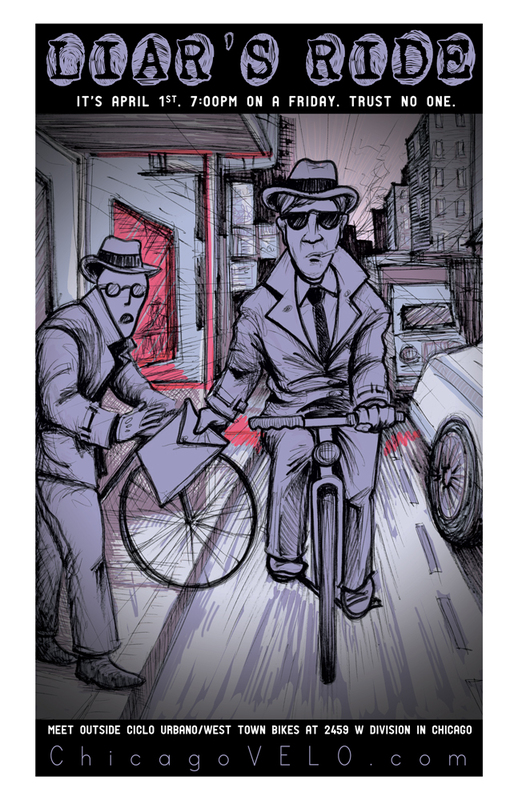 While the Liar’s Ride is and always has been an adventure in cycling satire and very little of the event is serious, it is free. Most of our rides are $10 on site, but each year, the annual April Fool’s Day ride is completely un-serious, almost entirely untrue, and free for all to join. Before we resume the silliness already in progress, I do in all seriousness ask you to consider making a donation to West Town Bikes instead of the ride amount, or if you can afford it, a bit more. You can do it online at the link below, and I will ask again at the ride, with the proceeds to be passed on to Alex Wilson, the Founder and Executive Director of West Town Bikes, bike guru and great person. West Town Bikes is a non-profit community bicycle learning center and Ciclo Urbano is its full-service bike and repair shop. West Town Bikes serves the city and its citizens by providing all manner of support and services related to bikes, bike mechanics, bike riding, commuting and using bikes as a tool for positive transformation of individuals and communities. West Town Bikes is responsible for a wide array of bike related activities throughout the year and around the city as well as through an extensive calendar of workshops, classes, youth programs, job training and advocacy. West Town Bikes teaches beginners and aspiring bike mechanics alike, and offers open shop time with trained mechanics and supervisors as a community resource for repairing and maintaining one’s bicycle. They can even help you build your very own bike or help you enjoy riding your bike more. Ciclo Urbano is a full service community bicycle shop that supports the Humboldt Park and West Town Neighborhoods by focusing on affordable and reliable transportation. They provide sales, professional service, parts, accessories, and both new and used bicycles to suit many different needs. The shop supports the mission of West Town Bikes by offering several entry-level jobs and internships for graduates of youth bicycle programs. Why don’t you join us at the ride to find out? Every year we meet on April Fool’s Day at West Town Bikes in Humboldt Park to enjoy a silly journey on our bikes, ending at Fischman Liquors, a bar in Jefferson Park. Along the way, you’ll be subject to an infinite number of horrors and will probably never be the same. And it will be the unquestioned greatest night of your life. You can buy the Ross Felten poster for $5 right here. Stay tuned for updates leading up to the ride here, on our email list, on our Facebook page and on the event’s Facebook Page. This entry was posted in Chicago Velo Blog and tagged Liar's Ride, West Town Bikes on March 24, 2016 by Lee Diamond.